Once upon a time there was a wealthy and rich king. He was known for his flawless administration and ruled the hearts of his subjects. People would come to him carrying their problems, with high hopes and he would never send them back disheartened. Time passed, years flew by and the king started to become old and frail. He began to worry about who take care of his kingdom after his death. The question of who would be the heir for his chair started to loom his mind. The king was blessed with three sons, who were loyal obedient and respectful towards the king. But he wanted all three of them to go through an acid test in order to prove themselves and to see who had the real caliber and who was fit to be a king. So he decided to chalk out a plan. He called his three sons and gave them 100 gold coins each. Time of one year would be given to all of them to use these 100 gold coins. 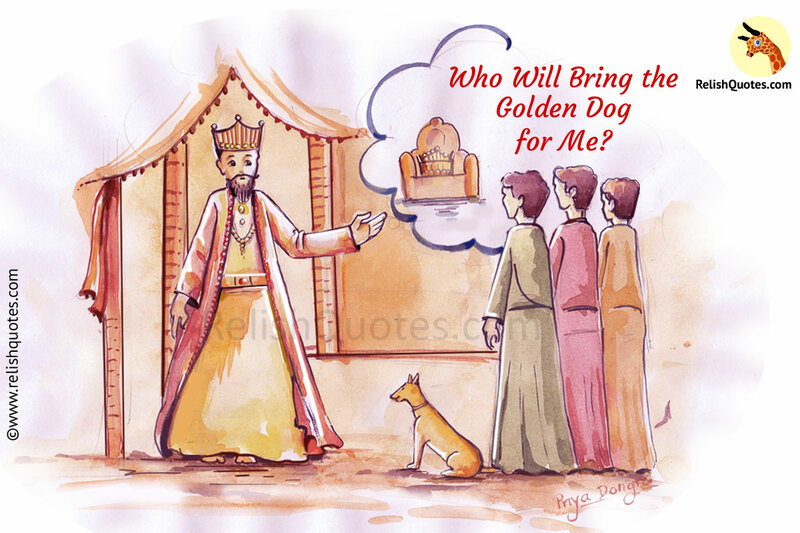 Then he said,” whoever brings a golden dog for me shall be my successor”. The three sons set out with their own set of gold coins. The eldest of three brothers went to the city and took a palace on rent for himself. Then he hired some men, and sent them in all four directions, with the order to find the golden dog. After a few weeks, these men returned empty handed. In all of this process, his 100 gold coins got over. The eldest son lost the fight for the throne then and there. The second son became a broker in the town and started lending money to people on lower interests. He earned multiple profits through this business and with the money he had of profits, he gave the local goldsmith the order to make a Golden dog. These words and feeling of the youngest son brought tears to the king as he had felt and related himself to all the feelings of a common man, essential for a future king. Well deserved, the throne was given to the youngest son for his capability and merit.